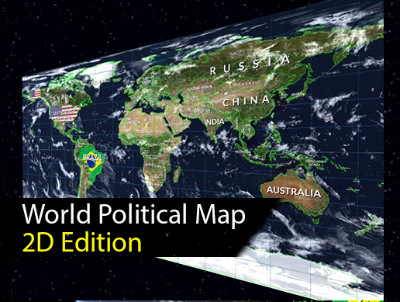 World Political Map - 2D Edition adds to your scene a beautiful, customizable and interactive 2D political map in just a couple of clicks. Drag the map into the assembly on the stage and adjust the appearance. * Procedureally attracts the borders of 241 countries, 4112 provinces and states and the location of 7144 most populated cities in the world! * Fully interactive map: zooming, panning, selecting, regions of countries, provinces / states and cities are highlighted when you skip the mouse over them. * Can be created and managed by code (API and provided documentation). * Calculator: unit converter from lat / lon to XY coordinates and city distance calculator. * Tickers: scrolling, flashing and fading messages. * Decorator: customize the appearance of countries (colors, textures, labels). - Three types of cities, including the capital of the country and the region. - Automatically draws country labels with layout options. - Colorize countries, provinces / states or entire continents! - To support the texture in the country! - Find and swim in any country, state or city by name from the current position. Also find / fly to any place on the map in latitude / longitude. - Mount Points: add your custom strategic locations from the editor and easily find / move / position the objects. - Two levels of detail for the boundaries in the scale of 110.00.000: 1 and 30.000.000: 1. - Imaginary lines: dial latitude, longitude and cursor line. - 8 earth styles from light styles to advanced styles, including Scenic shaders (clouds + relief effects) and textures with high resolution up to 16K with custom shaders. - Internet is not required! Geographic data included in the asset that Google Maps does not use, and no other card provider. It makes it very fast and works offline! - Mobile cellular: tested on Android and iOS. - Source code is enabled (C #).